This book is a significant step towards developing a body of management knowledge pertinent to the context of Library Information Science (LIS) and provides a succinct but deep account of management and information organizations. 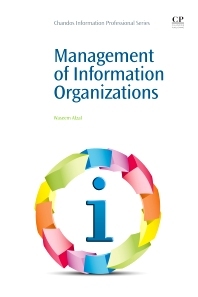 Management of Information Organizations presents a broad view of the information organizations and the nature of management in these organizations, and how information professionals are affected by such management systems. The book equips the reader with the knowledge that will enable them to develop a strong intellectual foundation relating to management and its manifestation in an information organization and provides a significant step towards developing a body of management knowledge pertinent to the context of LIS. Waseem Afzal is a member of the School of Information Studies at Charles Sturt University in Australia. His research has been published in various journals, including the Journal of Information Science; International Journal of Education Research; Library and Information Science Research Electronic Journal; Journal of Information, Society and Justice; and Emporia State Research Studies. Afzal’s current research interests include the topics of management, organizational theory, strategy design, information industry, research methods, and socio-cultural influences on human information behaviour, LIS education, human information interaction, knowledge management, and information economics.